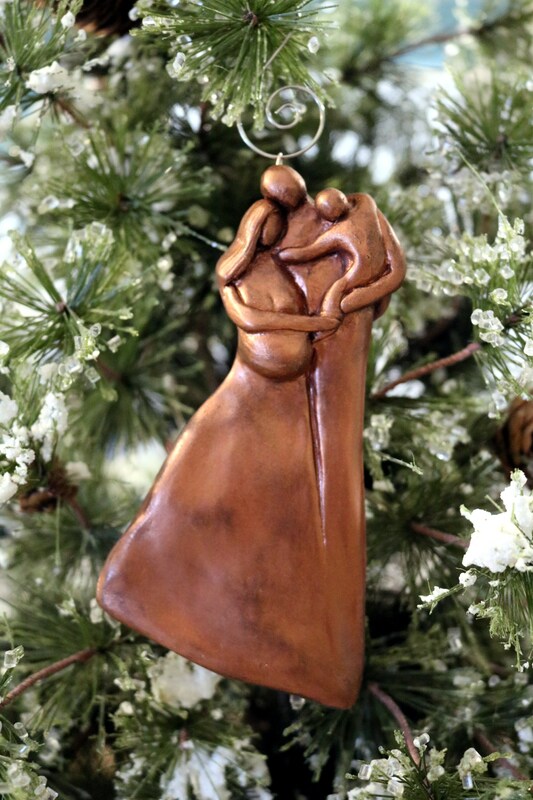 Celebrate your (or your friend's) pregnancy with a sculpted Copper Christmas ornament of a family of three who are expecting a new baby! This pregnant family Christmas ornament that features the expecting parents and their toddler is the perfect memento to celebrate their pregnancy this Christmas. This also makes a great gift for someone who collects ornaments each year that represent important milestones in their life. The ornament comes ready to hang with a metal hook. It would look great hanging on the Christmas tree or displayed on an ornament hanger all year round. The original ornament design is first sculpted out of clay. Then a mold is made from the original clay design. Finally, I cold cast aluminum, bronze or copper into the mold and finish the final piece with a metallic paint that is antiqued with black or brown acrylic. This pregnant family Christmas ornament is about 6" long. Because each Christmas ornament is handmade, there may be slight variations compared to the one photographed. Personalize this Christmas ornament by making the toddler a girl, engraving a ribbon with the year, child's name or family name. Include any personalizing details in the "Note to ElizabethBonura" section when you make your purchase. 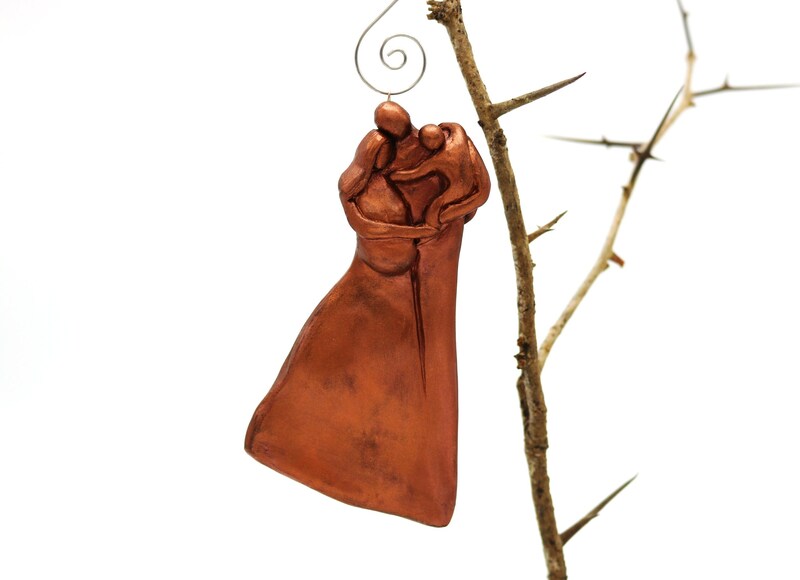 About Elizabeth Bonura: I create Family Christmas Ornaments, Anniversary Plaques and Sculptures all inspired by life, love, and mostly family! One key feature of my family designs is all the figures are connected and become one. I was greatly inspired by the idea of when a couple gets married, two become one. When I began to add children to my designs I continued the theme of connectedness by creating the children around the parents all emerging together.